Often referred by the title Free Electric Sound, Gila's debut is an amazing work, full of acid guitar freakouts, spacy organ and mellotron, exotic rhythm structures, and loads of electronic effects to fully realize the psychedelic visions. From the Floydian space rock of the first two tracks the record moves into even stranger realms on the four segued pieces that make up the second side of the original vinyl. "Kollaps" starts off with ritualistic drumming, a creepy organ riff, a crying baby, and guitar licks that threaten to explode at any moment. After some electronic effects "Kontakt" goes in an entirely different direction with airy acoustic guitar and keyboards and no rhythm section, like suddenly emerging into sunlight after the darkness of "Kollaps." As the track progresses seamlessly into "Kollektivivtat" and then "Individualitat" it again picks up momentum, adding electric guitar riffs and an interesting mixture of bongos and snares as the organ cuts loose, until finally everything dies except the thundering percussions on some quasi-ethnic workout with some electronic sounds thrown in. Formed in early 1969, out of the Stuttgart political commune, as Gila Füchs, we can only guess as to what their music was like in these early days, yet they quickly established themselves as the foremost exponents of psychedelic space-rock. By 1971, with the shortened name Gila, they recorded one of the finest cosmic classics of Pink Floyd inspired space-rock. Gila (sometimes quoted as "Free Electric Sound") is a mainly instrumental trip and feels much like one suite per side. Superbly conceived, it featured an amazingly innovative music that took hints from all the classic Pink Floyd inventions, and went further, blending in ethnic textures with the complex multi-guitars of Conny Veit, and superb percussive fired space drives. Naturally, it's widely regarded as one of the finest Krautrock albums. 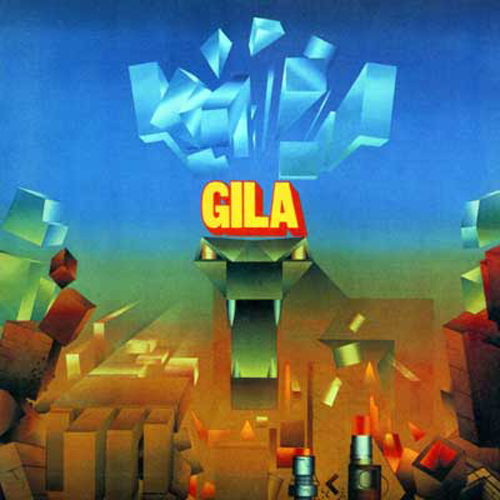 Gila were an extraordinary band, at the peak of the Krautrock ladder, and it's a shame that this original incarnation only made the one album. Gila had a vast repertoire, and concerts would include jams in excess of 20 minutes, covering a range from weirder Guru Guru realms to the most ethereal Agitation Free kind of trips. After disbanding for some six months or so, and working as a member of Popol Vuh, Conny Veit decided to form a new incarnation of Gila. This new band was a veritable supergroup, as it featured Popol Vuh leader Florian Fricke and ex-Amon Düül II multi-instrumentalist Daniel Fichelscher. Although hinted at by the earlier Gila, the new Gila sound was very much in the Popol Vuh style, with medieval and ethnic touches in a complexly textured rock music featuring multi-guitars and female vocals. Whereas Popol Vuh were purely a studio band, Gila toured and played many concerts, and existed until summer 1974. After this Danny Fichelscher joined Popol Vuh, and Gila eventually split. Conny Veit then joined Guru Guru for a short while before disappearing from the scene for several years. He reappeared within the ranks of Popol Vuh some time later. Whether he has made any other music, we don't know. Overigens wel een lekker plaatje voor diegene die geen zin hebben in door Drees1 afgezeken rap of typische Richardus-meuk. Het eerste nummer is een saaie Hendrix lookalike, surfdude. Edoch, het vervolg biedt mooie psychedelische uitstapjes voor de avontuurlijken van geest. Ik luister nog wat door. Hensup schreef: Het eerste nummer is een saaie Hendrix lookalike, surfdude. Edoch, het vervolg biedt mooie psychedelische uitstapjes voor de avontuurlijken van geest. Ik luister nog wat door. Kijk, zo ken ik je weer, Maralde. Dat accoustische intermezzo was qua idee wel heel erg gejat van The Narrow Way, mais bon, de opbouw naar de climax met de duivelse percussie is magistraal. Surfdude, ik vind deze plaat lang niet gek. Wat zeg ik. Ik vind deze plaat bij lange na niet gek. Zou 'm graag nog eens opzetten. Niet nu. Eens. Hensup schreef: Dat accoustische intermezzo was qua idee wel heel erg gejat van The Narrow Way, mais bon, de opbouw naar de climax met de duivelse percussie is magistraal. Surfdude, ik vind deze plaat lang niet gek. Wat zeg ik. Ik vind deze plaat bij lange na niet gek. Zou 'm graag nog eens opzetten. Niet nu. Eens. Mjah.. Ik beoordeel de plaat liever op z'n eigen merites dan de vergelijking met Floyd. Evengoed: Als je jezelf met Floyd kan vergelijken, en zeker met The Narrow Way, dan doe je iets erg, erg goed.